EPRDF Orchestrated War between Nations in Ethiopia Must Come To an End! 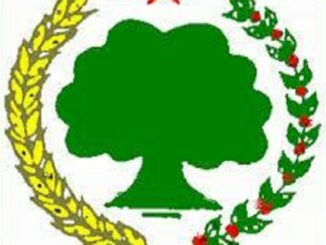 Under the iron feast rule of Ethiopian Peoples’ Revolutionary Democratic Front (EPRDF), the peoples of the country are subjected to insufferable conditions for the last 27 years. 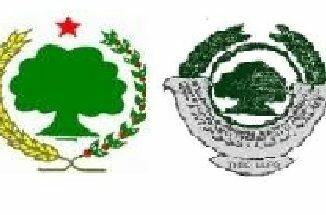 Unsatisfied with these, currently the regime is resorted to instigating a full-scale war between peacefully coexisted nations and peoples of the country; as it is hellbent on setting the Oromo and Ogaden Somali at each other. If left unaddressed, the situation potentially escalates into an irreversible catastrophe. Moreover, the regime also gives deaf ears to ongoing popular demands for a fundamental change in Ethiopian political landscape. Although the government of Ethiopia has been masterminding conflicts for the last 27 years; the degree and intensity of the last two years is unprecedented. To avert the popular mass movement since 2015, the regime has deliberately instigated war between Ogaden Somali and Oromo to cause the death of hundreds of civilians from both sides. Additionally, it has also mass killed the Oromos living in and around Oromo-Ogaden neighbouring areas using its special killing squad known as ‘Aga’azi’ and Somali special militias known as ‘Liyu’ Police. Vindictively, the EPRDF masterminded the eviction of hundreds of thousands of Oromo people from their homes in Oromia Region and Ogaden Somali region. Furthermore, the government is also actively engaged in continually massacring hundreds of unarmed Ogaden Somali civilians living in Oromia using its indicated special commando, Oromo’s pro-EPRDF cadres and security forces in a barbaric manner. Thus, hundreds of Somalis have been displaced from their homes in Oromo region. The PAFD categorically condemns such criminal acts. As we speak, due to the indicated conflicts, a heavy fighting is underway in Southern and Eastern parts of the country between both fraternal nations resulting in further bloodshed. We know that all the unfolding tragedies between the Oromo and Ogaden Somali, and the rest nations of the country are deliberately engineered by the EPRDF, whose politicians and Generals are hellbent on silencing their subjects employing sheer level of violence in addition to unlawful incarceration, intimidation, torture and mass killing. 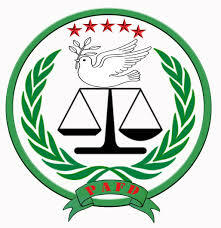 The PAFD categorically condemns such EPRDF instigated war between the two fraternal nations who share tremendous socio-economic, cultural and moral attributes. We urge both nations and the rest peoples of Ethiopia to exercise utmost restraint; and instead fight in unison, the regime who denied them all their dignity. 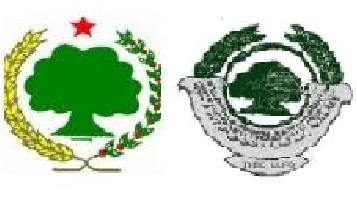 We also strongly advise all peoples of Ethiopia to be vigilant and aware of the EPRDF’s divide and conquer agendas. We urge the EPRDF regime to unconditionally stop its barbarism! Finally, we urge all the opposition political forces of Ethiopia and the entire segments of the society, to stand shoulder to shoulder to fight the oppressive regime until freedom, peace and democracy asserted in the country. We also urge the international community to unconditionally stop their support of the decaying EPRDF who sustains its rule with your support. We urge all peoples of the country to know the unshakable fact that, all unfolding conflicts in Ethiopia are deliberately orchestrated and stage-managed by EPRDF alone. It must be crystal clear to the stakeholders and the international community that, the EPRDF and its cadres alone bear responsibilities for unfolding tragedies when the right time comes. 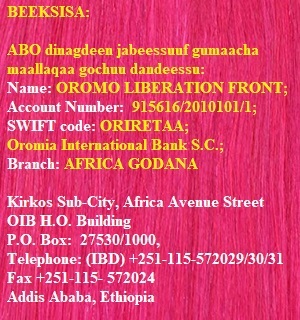 Justice, Freedom and Liberty for all peoples of Ethiopia!